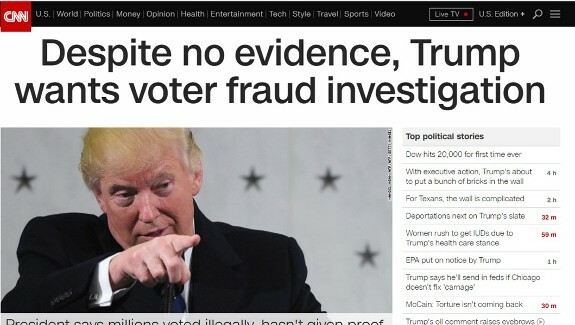 Anti-Trump network CNN and some establishment Republicans, such as National Review senior editor Jonah Goldberg and South Dakota’s Republican Senator John Thune, continue to discount the established fact that there are millions of illegal voters on the rolls and that many of them have indeed voted. Wouldn’t it be nice, says our friend former Department of Justice attorney J. Christian Adams of the Public Interest Legal Foundation, if just once, some of the people whom Soros pays to tell us that voter fraud doesn’t exist admitted they were wrong? While that is unlikely to happen because they are paid to lie to advance their Far Left anti-constitutional agenda, Adams has done the next best thing: prove they are both wrong and lying about it. By producing documents that prove at least 1,000 instances of voter fraud showing aliens registering or voting in the key swing state of Virginia. And, says Adams, there are certainly far more to be found if someone would do the research. This detailed study by the Public Interest Legal Foundation, or PILF, (with which Adams assisted) documents more than one thousand aliens on the voter rolls. It provides the government documents with the names. Here’s the most frightening part says Adams; the sample is only eight Virginia counties and doesn’t include the behemoths of Arlington and Fairfax Counties because their Democratic election officials refused to follow Virginia public records laws and cooperate in the study. Nationwide, how many illegally registered voters voted in 2016? Well, no one truly knows because the Obama administration and its Soros-funded allies on the Far Left have used lawfare to stymie voter ID, voter roll verification and voter roll purges that would quantify and rectify the problem. And they have been aided and abetted by the establishment media who have accepted without question the Democrats’ claims that there’s no such thing as voter fraud. However, if the media had chosen to investigate and report on the research that has been done and evidence presented by PILF, as well as in various voting-related lawsuits, President Trump’s claims would not be disputed. Adams was the lead in the expose of aliens illegally registering and voting in Virginia and Pennsylvania cited above, and when asked about nationwide numbers of illegal voting by aliens Adams cited a Pew study that found upwards of 4 million incorrect voter registrations containing the names of dead and ineligible voters. Alien registration and voting is the biggest problem of all says Adams. It’s not lack of voter ID. Aliens are GETTING photo ID when they are getting driver’s licenses. They are also getting registered to vote simply by marking the citizenship checkbox “yes” on the federal voter registration form. There are no checks in place in most states to verify they are really citizens. Worse, the Obama administration blocked access to federal alien databases that the states sought. Access is mandated under federal law and Florida had to sue the United States to get access to help clean their rolls notes Adams. The Department of Justice under President Obama created this situation because Obama opposed citizenship verification procedures for voting registration. It went to court against multiple states to stop them from ensuring that only citizens are registered to vote. (Florida, Kansas, Georgia, Alabama). They stopped enforcing Motor Voter that requires election officials to conduct list maintenance and the Help America Vote Act that requires clean rolls. After the inauguration in 2009, the Obama DOJ pulled the plug on numerous cases to enforce these laws noted Adams. Since then, the system has become corrupted with dead, ineligible and duplicate voters. The Obama administration opposed reasonable election integrity measures in North Carolina, Ohio and other swing states. They attacked voter ID in NC and efforts in Ohio to prevent the voter fraud that infested the 2008 election when Obama volunteers (such as Yolanda Hippensteele and Amy Little who pled to state charges) illegally registered in Ohio and voted simultaneously even though they lived in other states. Despite these incidents, the Obama Justice Department attacked Ohio’s list maintenance procedures. Illegal voting in a federal election is a federal crime. Yet the Obama DOJ virtually shut down voter fraud prosecutions and it gave a green light to vote fraud criminals in the 2016 election, as we saw from the James O’Keefe Project Veritas tapes where one Democrat said you’d never be prosecuted. So, the most significant way the Obama administration encouraged voter fraud was by not prosecuting it when it happened said Adams. For example, Wendy Rosen was the Democrat nominee for the 1st Maryland Congressional district. She voted twice for Obama, in Maryland and Florida. The Justice Department never prosecuted her. As many as 1 of 8 registrations in the United States are invalid said Adams and invalid registrations are the first step of voter fraud. And people ARE taking advantage of the corrupt rolls and voting illegally observed our friend J. Christian Adams. Donald Trump promised to go to Washington and drain the swamp, now that he’s here he can prove himself correct about illegal voting and drain one of the biggest Obama-created cesspools if he carries through on his recent tweet to launch a major investigation of illegal voting. Submitted by Charles Martel on Fri, 01/27/2017 - 01:34. I was shocked and dismayed (but not surprised) to watch Shepard Smith on Fox News repeatedly deny the existence of any evidence of voter fraud, same as the propagandists of the Communist News Network. With all the evidence gathered by J. Christian Adams and by James O'Keefe of Project Veritas, these lying slimeballs' careers should be flushed down the same crapper as that of Dan Rather for his fake news slander of former President Bush a number of years ago. Doesn't ANYONE on TV have any journalistic standards anymore? I thought Fox might have retained theirs, but I guess not.